Cut a big piece of clingfilm and place 1 scoop of strawberry ice-cream, 1 scoop of vanilla, 1 scoop of chocolate and finally 1 more scoop of strawberry ice-cream in a row. Wrap the ice-cream tightly in the clingfilm to form one long piece and put it in the freezer for 10 minutes. 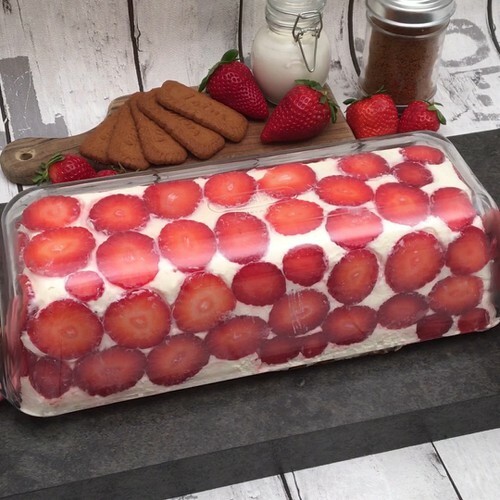 Cut the strawberries into slices and arrange them on the bottom and sides of a glass terrine mold. In a bowl, beat the mascarpone, cream and icing sugar. Then spread half the mix on the bottom of the mold over the strawberries. Remove the ice-cream roll from the freezer, remove the clingfilm and arrange it in the middle of the cream mix. Cover the ice-cream with the rest of the cream mix. Arrange the biscuits on top of the cream and place the cake in the freezer for 4 hours to harden. Remove the mold and enjoy slices of the roll chilled.